Graveyard of the Atlantic is a nickname of treacherous waters and location of numerous shipwrecks off the Outer Banks of North Carolina. This location has numerous shoals and frequent rough seas. Another area off Nova Scotia is also known (to a much lesser degree) as the resting place of many shipwrecks. This is due to frequent thick fog which increases danger, especially near Sable Island. The Graveyard of the Atlantic Museum, located in Hatteras Village, focuses on the history of this area and features many artifacts recovered from area shipwrecks. Line engraving published in "Harper's Weekly", 1863, depicting the USS Monitor sinking in a storm off Cape Hatteras on the night of 30-31 December 1862. Along the Outer Banks, navigational challenges posed by the Diamond Shoals area off Cape Hatteras, caused the loss of thousands of ships and an unknown number of human lives. More than 5,000 ships have sunk in these waters since record keeping began in 1526. Among the better known shipwrecks was the USS Monitor,  a participant in the famous Battle of Hampton Roads during the American Civil War. 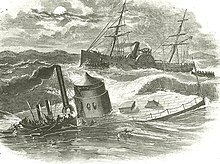 The Monitor foundered and sank on December 31, 1862 off of Cape Hatteras. Survivors of a much earlier shipwreck created the lost town of Wash Woods, Virginia using lumber that washed ashore. However, the extreme weather eventually claimed the town as well. The Graveyard extends along the whole of the North Carolina coast, northward past Chicamacomico, Bodie Island, and Nags Head to Sandbridge Beach, and southward in gently curving arcs to the points at Cape Lookout and Cape Fear. This spot is known as Cape Point, which is the stretch of beach that divides Hatteras Island's north and south facing beaches. This dangerous spot is known for its good fishing and surfing. It is a very famous spot on the east coast, despite its fragile location. Cape Hatteras has been a deadly trap for sailors that have entered for past centuries. This stretch of shore is home to more than 600 shipwrecks off the shifting sandbars of the Hatteras Islands. The sandbars shift due to rough waves and unpredictable currents. Another danger was the Outer Banks "wreckers." Some residents of the Outer Banks, known as wreckers, made part of their living by scavenging wrecked ships — or by luring ships to their destruction. Horses with a lantern tied to their neck would be walked along the beach. The lanterns' up and down motion would appear to other ships to represent clear water and a ship ahead. The unsuspecting captain would then drive his ship ashore following the false light. During World War II, German U-boats would sit offshore and silhouette passing freighters and tankers against the lights onshore. Dozens of ships along the North Carolina coast were torpedoed by submarines in this fashion in what became known as Torpedo Alley. The most recent ship lost was on October 29, 2012: the Bounty sank off Cape Hatteras when Hurricane Sandy passed through. Two people were pronounced dead from the accident. Sable Island is dangerous because it is always shifting and does not have a set position in the ocean. It is dangerous to ships thanks to the meeting of the Labrador Current and the Gulf Current, which can cause very rough waters and thick fog. Its situation is especially dangerous for ships, because they can be pushed near the island and then run aground. Sable Island has been called the fastest moving island in the world, due to the shifting of the plates below it. The rough weather also causes planes that fly nearby to crash into the ocean, where they sometimes surface on the shores of the island after storms. Considering this checkered history, the Canadian Government has installed a few additions to prevent ships from running aground. In 1872, the Canadian Government added two lighthouses on each side of the elongated island, which has helped with the number of wrecks,  with the last known shipwreck occurring in 1999. The lighthouses are automated, but the island has a local crew year-round, which consists of five meteorologists. ^ Grussing, Valerie J. "Reanimating the Graveyard: Heritage Tourism Development of North Carolina Shipwrecks" (PDF). thescholarship.ecu.edu. Retrieved 18 July 2015. ^ Stick, D. (1981). Graveyard of the Atlantic. North Carolina, The University of North Carolina. ^ "El Salvador". Intersal, Inc.
^ Sable Island Green Horse Society (October 2002). "Sable Island Beach: Shipwrecks". Archived from the original on 2009-02-20. Retrieved 2009-05-22. ^ John Leaning (1999-08-22). "Cape Cod's reputation as a graveyard of the Atlantic endures". Cape Cod Times. Archived from the original on 2012-07-07. Retrieved 2009-05-22.